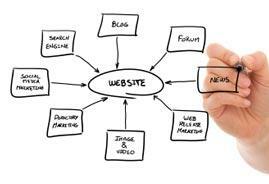 One of the first and foremost steps to be taken when planning a website is creating a website structure. The process of categorizing website content and creating the website structure forms the backbone of the future website as well as its potential success. A website with well-organized content achieves a high level of usability, search engine optimization, aesthetics, visual appeal, and user satisfaction. Let’s look at the overall structure of any type of website. 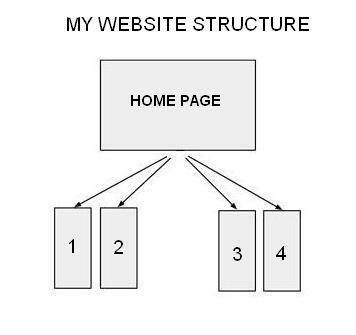 There are basically two types of website structure: hierarchical structure and flat structure. Website designers and SEOs recommend using hierarchical approach in order to further generate navigation links and create site maps. The good website structure iallows users to quickly and easily get to the content they want, without complicated navigation and confusing distractions. All websites have a main page/Home Page. Website Home Page is the first page visitors view when visit the website. Home Page is the most important page for obtaining search engine rankings. The About Page describes what the website is all about: website subject, goal, as well as provide information about the website authors/owners/founders. Most websites have the search box as a part of the website navigation system. Search box makes it easy for users to search for specific information. The sitemap helps search engines to index website pages and content. Sitemaps are very useful for full-of-content websites, online businesses, e-stores and websites with pages that are hard reachable via links. Here a few other types of website pages to consider: Portfolio, Company Story, Blog, News, Links, etc. Anyone wanting to build a website should pay close attention to the development of website structure. If the website structure is logical, well-organized and easy navigable, then the website will succeed. And, if the website offers high-quality relevant content (articles, product/service descriptions, images/photos, etc), then the website will succeed 100%. Before you design website, organize the content and create the website structure. A website is like a living thing where all systems are connected closely. Website developing is more than just creating good HTML codes, it is like creating a new living organism. There is a lot of information on the internet relating to website structure that it can actually turn into a real chore sorting out the facts from the fiction. Thanks for taking the time to put this piece together.